"I looked down at the river, and there went a bridge, a big, great big bridge going across the river. And I counted sixteen men that fell off of that bridge and drowned." "And I looked, and I seen coming up out of the river a big bridge, spanned across the river, and sixteen people fell off of it." "I seen moving up out of those bushes down by the river, and along there came a big bridge, and it spanned across the river. I seen men dropping off of it and losing their lives." "And I saw a bridge come up out of the wilderness. And it started across the river. 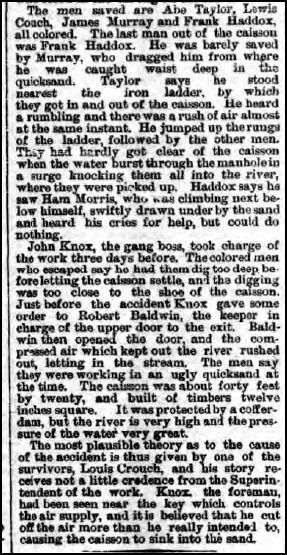 Sixteen men dropped off in--into the water and perished. And I seen a big sign, it said "twenty-two years." "And we were right up on the bank from the Ohio River. And I looked down towards Jeffersonville, and I seen a bridge rise up and go across that, the river, span the river. And I seen sixteen men (I counted them) that dropped off of there and lost their lives on that bridge." "And I looked down towards Jeffersonville, and I seen a bridge rise up and go across that, the river, span the river. And I seen sixteen men (I counted them) that dropped off of there and lost their lives on that bridge." These are several accounts of the prophet William Marrion Branham's first vision as a child, concerning a big bridge and 16 men being killed during it's construction. Notice what is said and also what is not said. While, we are not privy to every detail as to why Bro. Branham believed this event pertained and was fulfilled during the construction of the Municipal Bridge, I would like to suggest another possibility for the consideration of the believer. 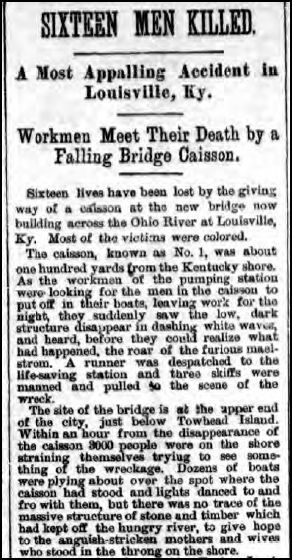 We have discovered information that there was an accident in 1890 that claimed the lives of 16 men during the construction of the bridge across the Ohio River between Louisville KY and Jeffersonville, IN. (See articles) One particular point that I would like to call to attention is that in the vision, Bro. Branham saw a big sign that said "twenty-two years." The prophet's recollection of the timing of the vision placed him as a young child. Had he had the vision around 1912 which is very probable, that would have been twenty two years since the accident had happened. Seeing visions of previous events would be a major part of the life and ministry of William Branham, and I suggest that this notable vision quite possibly could have been the divine providence of Almighty God in allowing the prophet to review that accident. It's not unheard, that a prophet would see a vision and not understand. Even Peter initially misinterpreted the vision of the unclean animals in Acts 10. He pondered over it. And even if the prophet's understanding was incomplete - the vision was from God. I believe 1 Peter 1:10-12 indicates that the OT prophets didn't fully understand the meaning of their own prophecies. Divine intent and human comprehension cannot be regarded as one and the same. There are a couple of instances where Bro. Branham, in telling the actual vision referred to the bridge as the "municipal bridge", but the vast majority of the accounts don't specify that. I believe he included that due to thinking it was the Municipal Bridge. 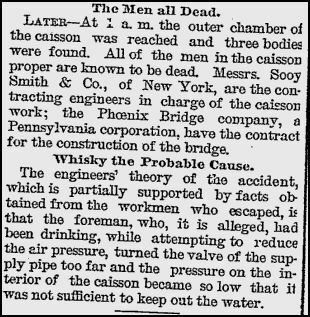 This is merely a theory - there could have been an additional accident where 16 men lost their lives - yet the record remains undiscovered or either was destroyed during the flood, yet I feel it is worth mentioning for the believers interest.